These electrostatically charged replacement filters are specially designed for Filtrete air purifiers, and will attract and retain microparticles that can aggravate allergies and cause respiratory problems. 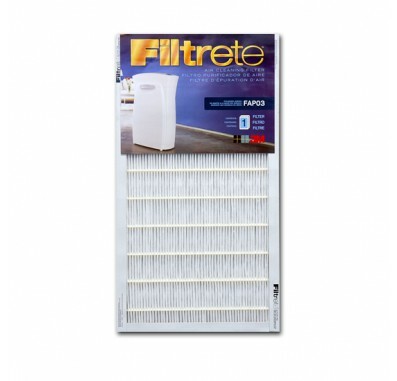 The Filtrete FAPF03 Air Filter is the replacement air cleaning filter for the Filtrete Ultra Clean Air Purifier FAP03-RS. The Filtrete FAPF03-RS Air Purifier Filter captures 99.9% of large airborne particles and allergens like pollen, mold and dust mite debris. Attracts and captures particles that can carry odors. This filter captures microscopic allergens like: smoke, smog, household dust, pet dander, bacteria and particles that can carry viruses. The FAPF03 Replacement Air Filter should be changed once every 3 months for optimum performance.